Pablo Fornals is currently the subject of transfer interest from Napoli, with the Italian club long time admirers of the Villarreal man. 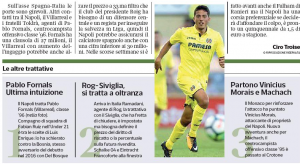 In their Thursday edition, Corriere del Mezzogiorno report contacts are ongoing between the Italian club, Villarreal and Fornal’s agents, named as the ‘Toldra brothers’. For a few days there have been rumours about a Premier League club also being in the mix, without that side being named. Corriere del Mezzogiorno say it’s Fulham, and that Claudio Ranieri’s club have come forward in recent weeks to try and build a deal for the midfielder. That’s got to be very unlikely when they’re up against Napoli, and it’s explained the Serie A club have the preference and advantage. Fornals has a €27m clause but his club can raise this to €33m automatically via a pay rise, in Italy it’s thought less than €30m could do the trick because Villarreal are looking at signings themselves and need the funds. In Spain they don’t really go along with such a discount. Regardless, this one sounds unlikely for Fulham, just like several of their other reported targets this month.